O'Ryans Village Candy Blog: Summer Fairs, Carnivals, and Festivals. Summertime is all about getting out and playing. There seems to be an unlimited number of things to do in the summer. 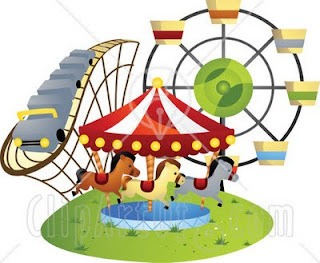 Any given weekend there are Church festivals, county fairs, ethnic fests, and carnivals set up in shopping mall parking lots. Small towns shut down entire sections of there town to host the vendors that provide food, fun, and goods that make these festivals worth attending. We have been to no less than six festivals this year and we haven't even gotten to the three county fairs around us or the big Kahunas, the State Fair and Summerfest in Milwaukee - The world's largest music festival right here in Wisconsin. We have our favorite events that we look forward to every summer and plan our other activities around them. As an adult my favorites of these are the festivals. Whether it is a Church festival or an Ethnic festival, the draw for me is the food! We have many churches in our area with Italian background. Needless to say the food is outrageous. Grilled Italian sausage and peppers, pizza, fried ravioli, and the meatballs. For dessert there is always Italian cookies, cannoli, and fried dough. The Greek and Italian fests are great also. Food, drink, live music and fireworks. What else could we ask for? As a kid, now that's a whole different story. It was all about the rides and the games! However we always made time for the roasted corn by the local JayCees, the fresh dairy chocolate milk shakes, and of course some cotton candy. We learned early on to get in on the rides first, corn on the cob and milkshakes aren't good to be enjoyed before the rock-o-plane, the scrambler, or the tilt-a-whirl. Shake up the system, THEN eat. Not vice versa. For a few months every year before the county fair came to our town in late July, I would be saving money by doing odd jobs around the neighborhood. All funds were earmarked for the fair. My Dad always threw in for the cost of admission and a little extra for food. "Mans gotta eat" he'd tell me. My cash stash was for the rides and games, Grandpa called them clip joints. "Just takin' a hard working boy's money" he'd add, but he still gave me a buck or so for the cause. Opening day would arrive and me and my buddies would be waiting at the gate for the opening. Usually about 9 or 10 hours later we would be dragging ourselves home after a completely exhausting day of fun. I actually remember getting scolded by my Dad for running through the entire $8.00 that I took there. I should have left half of it home for the next day. Wow! Times have changed. Sooo... For a few days out of the upcoming week or so, we are going to highlight these events here on our blog. We'll be sharing memories of the good times from our childhoods, our children's times, and some of the more recent years. Maybe you'll relate to some of our recollections and share your stories and comments with us here also.